Positive: Colored lines appear in the control regions (C) but do not develop in the test region. 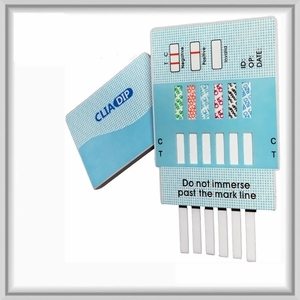 The absence of any line in any target drug test region indicates a positive result for that drug or drug metabolite. Physicians specializing in pain management write prescriptions for narcotics daily, and this unique drug test was developed specifically to assist in monitoring their patient drug usage. It is also important for doctors to identify medication usage from other sources that can complicate the plan of treatment.